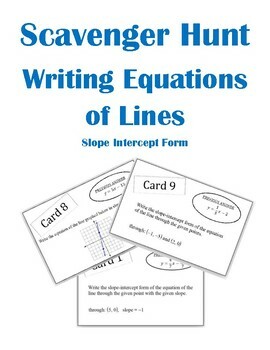 This is a 10 question scavenger hunt on writing equations of lines in slope-intercept form. Problems include writing equations given: a point and slope, 2 points, and a graph. 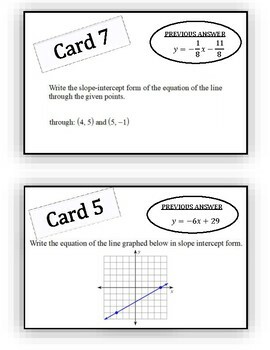 Students must first find slopes and then plug into a formula to put the equation in slope-intercept form. Scavenger hunts are a great way to get students actively engaged. I find that my students work better when they are up and moving around the room. I created this activity for my Algebra class as a fun way to practice the material we had learned. I also like this activity because it is self-checking. 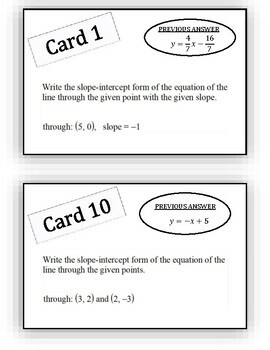 If a student gets an answer wrong, they will not know which card to go to next. This forces them to fix mistakes and ask for help. To use, simply print the problems out on card stock paper, cut them in half, and hang them around the room (laminate for longer use). I have my students work in pairs. 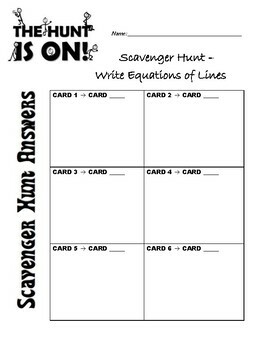 If I have a large class, I make two sets of the scavenger hunt on two different colored card stock. I then split the class in half and assign each half a specific color to work on. This will help keep the students separated and moving. Student recording sheet and answer key included. Happy hunting!